Changing Nonprofit Boards – Overcoming Nostalgia. In many US locations, there are several nonprofit organizations that are over a century old. In contrast, only a handful of the Fortune 500 companies claim this longevity level. However, when it comes to making organizational changes on nonprofit boards, < –more — > such as the board should set policy an leave operations entirely to management, board veterans often just don’t buy the idea. These persons feel that board members have to know operational details if the board is to assist the chief executive to achieve the organization’s mission.Some of these board veterans have nostalgic visions of how things used to be when the organization was a small one. Others fear that if they give up their operational roles, the organization will not be the “family” or caring organization they perceived they knew. If these directors are continuing to make good board contributions, the board chair and CEO need to try to persuade them that with growth, there has to be movements to meet changing times and to hire qualified managers and staff. New policy challenges need to be developed for these veteran directors. However, don’t be surprised if a few simply resign their board positions. 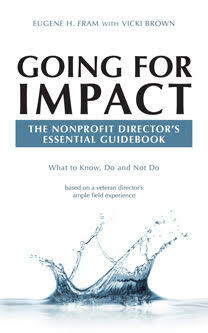 ← How to know when a nonprofit board has achieved a positive culture?